Barker was motivated by a diagnosis of throat cancer. “I knew smoking wasn’t doing my throat any good,” he says, “so I quit. Of course, I took all the treatments, too.” And, yes, he beat the cancer. Money was the reason to quit for Debbie Pyle, receptionist at Harper County Health Department. “I needed a pair of pants for one of my kids, and they were about $20. I figured I was spending about $20 a month on cigarettes. It meant a pair of pants every month for my kids.” She says she knew a fellow who prayed for God to help him quit smoking. A short time later, he had to drive to California with three other smokers. “By the time he got home,” Pyle says, “he was so sick of cigarette smoke he never smoked again. You can never tell how your prayers will be answered. Nagging your loved ones is regarded as ineffective, but, loving persuasion works. Health Department Director Frieda Schmidt successfully convinced her husband Ernie to quit. “I grew up listening to my dad’s smoker’s cough, and I didn’t want to have to listen to his (Ernie’s). I told him it really bothered me to hear him cough. Ernie listened to Frieda and quit. “Of course, he chewed gum to help him quit. The empty Juicy Fruit gum wrappers were everywhere. In the pick-up cab. His tractor cab. His combine cab. 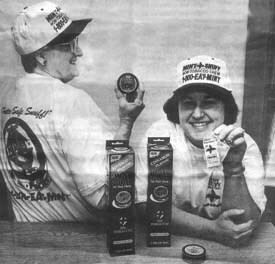 The floors were all yellow with gum wrappers.” And that observation led Frieda to have the health department to offer flee Mint Snuff to quitters during the Great American Smokeout (see photo). “One of the most noticeable symptoms of quitting is dry mouth,” she says, and chewing gum or Mint Snuff is a big help. 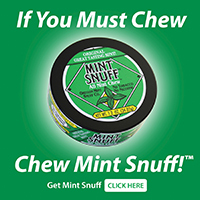 ” Taking up snuff or chewing tobacco is definitely not an acceptable route to quit smoking, and the Mint Snuff is actually intended to help smokeless tobacco users to quit that habit. Company literature is full of health warnings about the dangers of smokeless tobacco. Also offering products to relieve the side effects of nicotine withdrawal is Joe Brummer at Irwin-Potter Drug. Photo: Free Mint Snuff… Health Department Director Frieda Schmidt (left) and Receptionist Debbie Pyle display Mint Snuff being offered to combat the dry mouth symptoms experienced as smokers try to quit following tomorrow’s Great American Smokeout. The product was originally intended to help smokeless tobacco users kick their habit. Photo by J.W. Stout.